On Sunday morning, Paul woke up and announced he’d had a dream about fried chicken. I tried to ascertain if the dream was about eating fried chicken or cooking fried chicken but he couldn’t quite remember. It got me thinking of Gus’s Famous Fried Chicken in Memphis, TN where the closely guarded recipe is described as “having a little of this, a touch of that, a pinch of love, a dash of hot. Once in a while it’ll be so spicy the tears come. 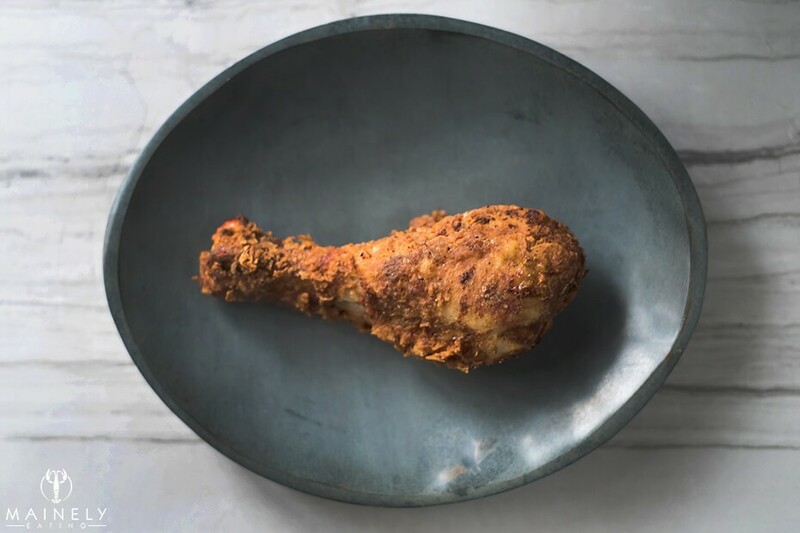 Usually, the heat is more gentle, like the touch of an old friend.” As luck would have it I’d just gotten my copy of the amazing cookbook “The Food Lab” by J. Kenji López-Alt and it had a whole section on the science behind fried chicken. 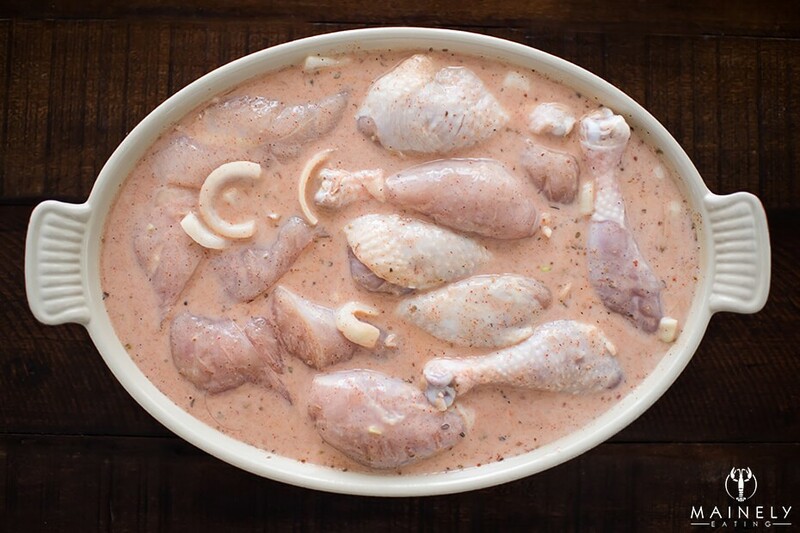 One of the many genius tips in The Food Lab book is simultaneously brining and marinating the chicken in a buttermilk/spice mix. 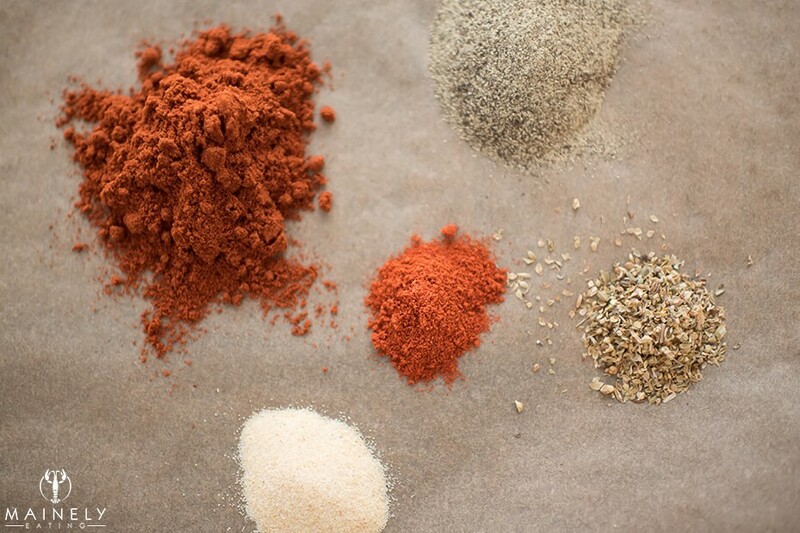 Prepare the spice mixture (don’t be tempted to dump it directly in the buttermilk – you have to split it into two – for the marinade and also the breading). Mix the paprika, black pepper, garlic powder, oregano and cayenne. In a large bowl or a gallon baggie, mix the buttermilk, egg, 2 tbsp salt and 3 tbsp of the spice mixture. I also threw in half a chopped up onion because it was languishing in the fridge. Add the chicken pieces and smush them around until they’re nicely coated. Refrigerate 4-24 hours (turn the chicken occasionally). Remove them from the fridge 30 minutes before you plan to bread them so they can come to room temperature. Mix the flour, cornstarch, baking powder, 3 tbsp salt and the rest of the spice mixture in a baggie or on a large plate. Take the chicken out of the marinade (allow them to kind of drip dry) and then toss in the flour/spice mix until thoroughly costed. Preheat oven to 375 degrees, have a cooling rack over a rimmed baking sheet (line with foil for easier clean up) in the middle/top part of the oven. Heat the oil in a dutch oven (you can also use a cast iron chicken fryer or a wok but covering them is difficult and the wok can be kind of unstable). Use a thermometer to get the oil to 360 degrees (you’ll see little threads start to dance in the oil). Using tongs, place the chicken pieces carefully into the hot oil (skin side down). Cover and cook for 3-6 minutes until it’s a lovely golden brown, turn chicken and cook uncovered for 3-6 minutes until the other side is brown. Rest for 5-10 minutes, season with malden sea salt and then serve with lots of napkins and paper towels! Double dipping is ok! If you like a thicker crust, once you’ve coated the chicken in the flour/spice mix, dip it back in the marinade and then back into the flour/spice mix. You can leave the skin on the chicken or remove it. I like to remove the skin on my pieces, Paul likes the skin left on. Don’t skip the covered/uncovered part of the deep frying. Put the chicken thighs or legs into the oil a few minutes before the breast so they’ll all be done around the same time. Fry the chicken in batches. Crowding the pan will cause the oil temperature to drop and result in a soggy crust. The chicken must go on a rack in the oven, putting it directly on the baking sheet will cause the bottom of the crust to go soggy. Let the chicken rest for 5-10 minutes on a wire cooling rack otherwise you’ll burn your mouth on searing hot chicken meat! Save the empty bottle that your oil came in. When you’re finished cooking all of your chicken, let the oil cool completely and then decant it back into the empty bottle to make cleanup even easier. 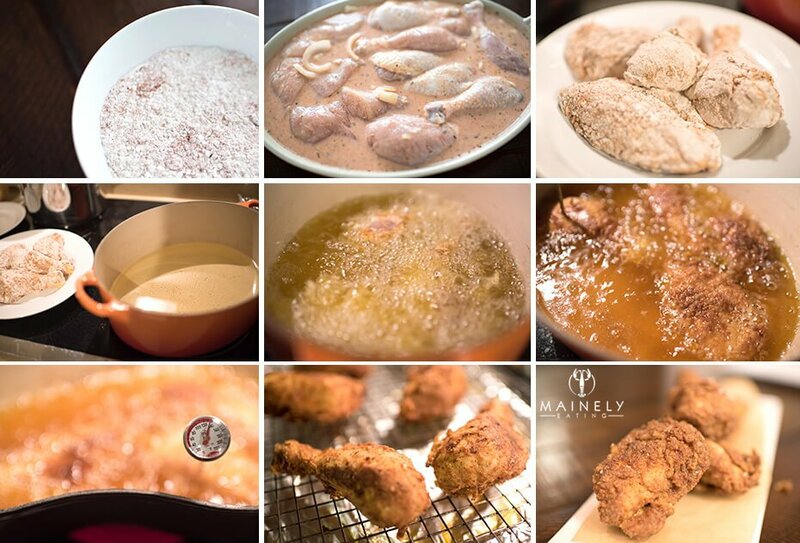 This entry was posted in Brunch, Home cooking, Lunch and tagged comfort food, Fried chicken recipe, homemade crispy fried chicken, tips for fried chicken by Mainely Eating. Bookmark the permalink. Looks delicious! Is there a preferred method for reheating so that it stays crisp? I don’t thin you can ever get as quite as crisp as the first time you cook it, it only takes a short time in the refrigerator to destroy your lovely crisp 😦 I actually quite like to eat it cold. I’d definitely skip the microwave! If you’d like to reheat fried chicken, I’d simply put it on a wire rack over a baking sheet in a 350 degree oven until it’s crisp and hot all the way through. Letting the chicken pieces come up to room temperature before the go in the oven will save you from a cold center and over-browned outer. I’d expect the cooking time to be 10-30 minutes depending on how large your chicken pieces are. 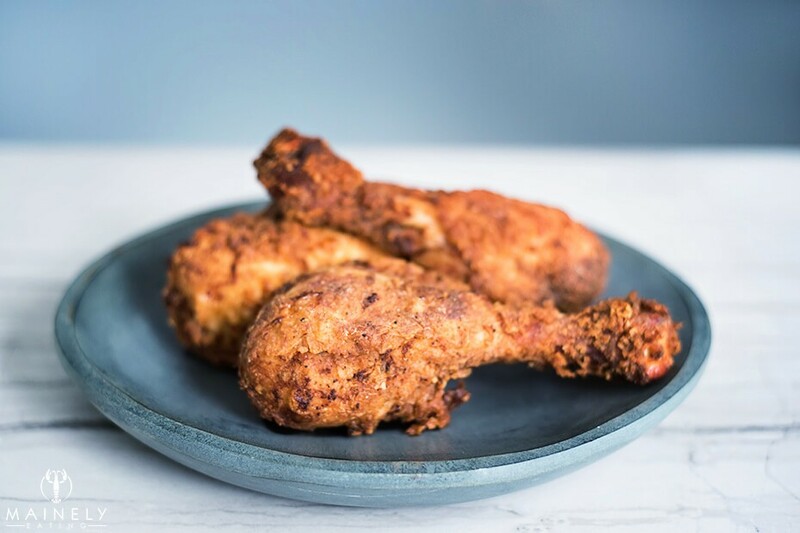 I haven’t tried it myself but I know that some people swear by re-frying the chicken to heat it up – if you try that I’d love to know what you think! The fried chicken looks absolutely delicious!! I bet it’s super crispy on the outside and juicy on the inside! I also like to marinate my chicken in buttermilk overnight to get that moist consistency. Great recipe! !